Last June 2013, Intel launched its 4th generation multi-core processors codenamed and marketed as Haswell. Just like its preceding Ivy Bridge core CPUs, the Haswell is manufactured with Tri-gate transistors fabricated in 22 nm technology. This review briefly covers the innovations and test benchmark of five quad core Haswell processors (i7-4702MQ, i7-4700MQ, i7-4800MQ, i7-4900MQ, and i7-4930MX), plus the capabilities and relative performance of its in-built HD Graphics 5200 and 4600. Increased new instruction set extensions and features including AVX2, FMA3, and TSX support. In addition, the integrated graphics engine has been modified to handle more executions. Depending on the CPU model, the Haswell GPU units can have 10, 20, or 40 EUs compared to just 6 or 16 EUs on the GPUs integrated with the Ivy Bridge CPU. The fastest is the Iris Pro Graphics 5200, also called the HD Graphics 5200, which has an added dedicated video memory of 120 MB eRAM is shared with the CPU. Last but not the least, because the Haswell CPU has the voltage converter built in, the thermal design power (TDP) efficiency of its regular dual and quad core engines has increased by 2 watts. Depending on the CPU model, this means a range from 17 to 57 watts. On the other hand, its ULV engines benefit with a watt reduction in TDP which means a range from 15 watts to 53 watts, inclusive of chipset. Most of its CPU-Chipset configuration designed for the largest Ultrabooks now has a total power consumption of just 28 watts. Intel’s 4th generation CPUs has five new quad core processors, three models in the M series (Core i7-4930MX, i7-4900MQ, and i7-4800MQ) and five in the H series (Core i7-4950HQ, i7-4850HQ, i7-4700HQ and i7-4702HQ)). The Core i7-4930MX is the fastest in the list which directly replaces all the CPUs in the Ivy Bridge 3rd generation with similar clocks and L3 cache. 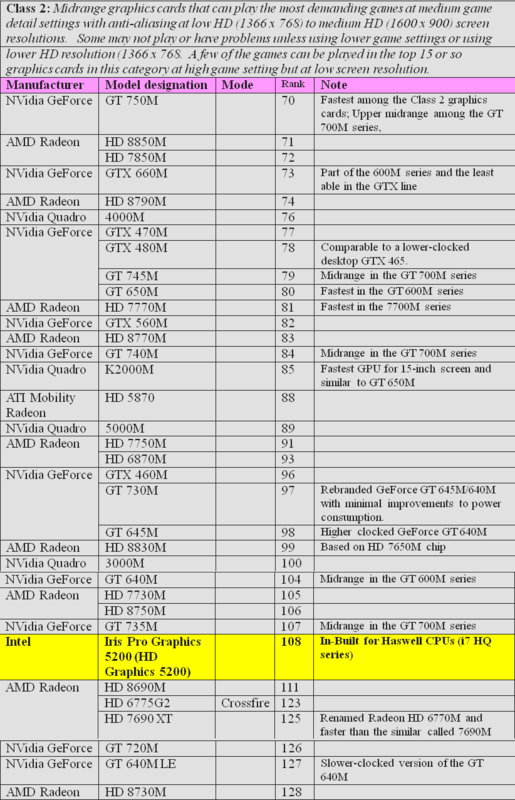 Table 1 below summarizes the base configuration of each Haswell CPU model. Haswell is anything but an entirely new CPU architecture. Its improvements over the Ivy Bridge are certainly not cosmetic, but they are incremental to some of the current Ivy Bridge CPUs, mostly in the top 30 echelons of more than 200 CPU models and configurations currently in use. 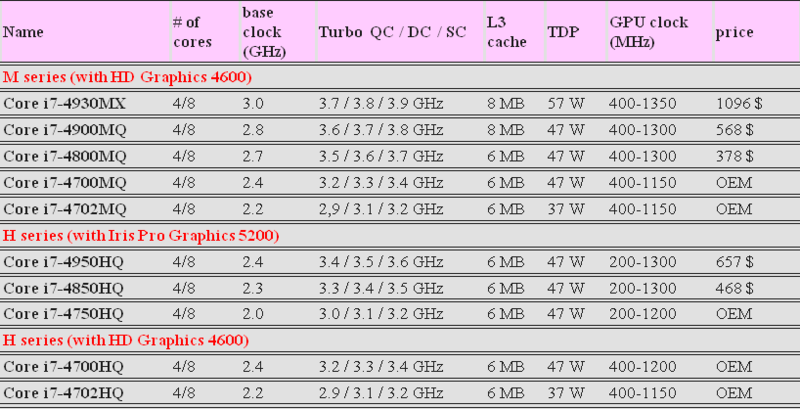 To put the new 4th generation CPU into context relative of current 3rd generation Ivy Bridge CPUs, Table 2 ranks the quad core Haswell CPUs based on clock speed and a couple of performance benchmarks. The top of the line Ivy Bridge i7-3969X remains unchallenged, while the top-of-the-line Haswell (i7-4930MX) in 6th place beats the 3rd place Ivy Bridge i7-4770K in terms of power consumption, giving any laptop powered with it the same muscle at longer battery lives. 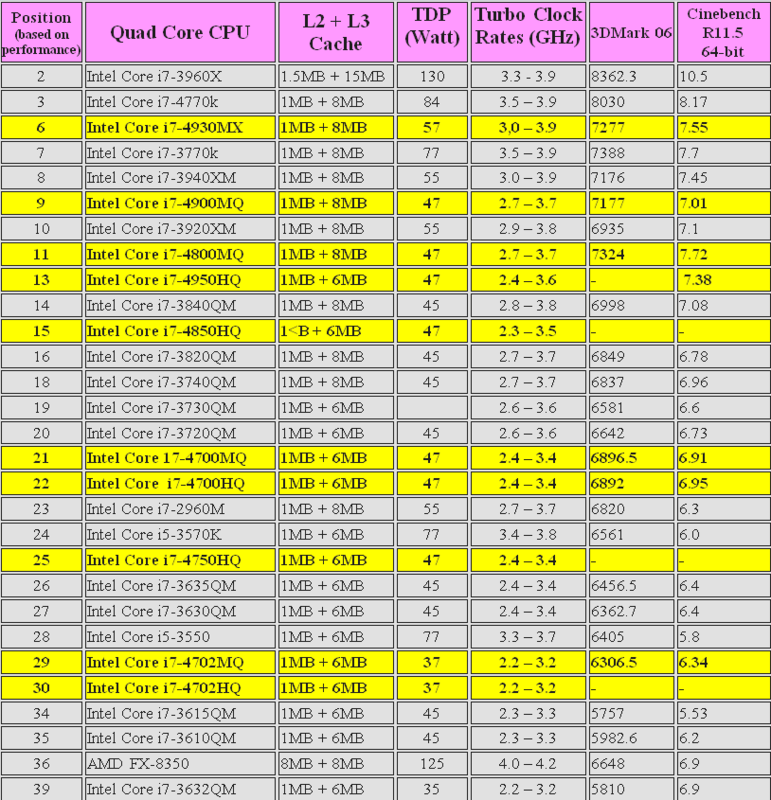 Table 2: Haswell CPU (highlighted) models relative to existing Ivy Bridge quad cores. The most significant improvements are its ability to handle additional instruction sets such as AVX2, BMI (Bit Manipulation Instruction), TSX (Transactional Synchronization Extension) and FMA3, to mention the major ones. AVX2 is an integer extension of the first AVX generation, while FMA3 adds a few novel instruction sets for floating point mathematical processing with operands in the 128 and 256-bit ranges. (This has no direct compatibility with the FMA4 already supported by the new generation AMD Richland and Trinity processors on top of its FMA3.) BMI improves data cryptography processing while TSX simply optimizes parallel task synchronization. The pipeline shares the same 14 to 19 levels of the Ivy Bridge architecture with minimal changes. There are no changes in the front ends other than an improved prefetcher and optimizing prediction performance in fetching cached data. In contrast, the back end processing benefits the most improvements making use of larger buffers which improve efficiency and flexibility with out-of-order processes schedules. The number of executive units was also increased from 6 to 8 parallel instructions.The most significant improvements are its ability to handle additional instruction sets such as AVX2, BMI (Bit Manipulation Instruction), TSX (Transactional Synchronization Extension) and FMA3, to mention the major ones. AVX2 is an integer extension of the first AVX generation, while FMA3 adds a few novel instruction sets for floating point mathematical processing with operands in the 128 and 256-bit ranges. (This has no direct compatibility with the FMA4 already supported by the new generation AMD Richland and Trinity processors on top of its FMA3.) BMI improves data cryptography processing while TSX simply optimizes parallel task synchronization. With the Ivy architecture, processing throughput declines when there is not enough data going through the pipeline. To remove this bottleneck, Intel not only widened the size of the L2 TLB, but also doubled the L1 and L2 interface. In addition, the bandwidth of the L3-Cache (LLC) shared across all the CPU cores was widened to include a couple of dedicated data pipelines. While the LLC shared the same CPU clock domain as in the Ivy Bridge CPUs, the new Haswell improvements allow for independent clocking. This is particularly beneficial in graphics application where the GPU load is often much higher than the CPU load. This allows the CPU cores to run at lower clock rates that save battery energy, while the GPU still benefits from the full cache clock speed. The changes in the new Haswell look incremental with current benchmark tests. This is most likely due to the fact that the tests have not really been optimized to draw on the improvements. The 10% boost in performance may not be felt especially with current applications and games that do not maximize on the Haswell’s new instruction set extensions. The next 12-18 months, however, should see a crop of new software that can harness these hardware improvements that is sure to lead to more palpable real-world performance improvements. In the meantime, one can already benefit from the energy efficiency offered by the new Haswell architecture. Intel implemented a significantly more intelligent Power Gating feature which disconnects idle or unused CPU components from consuming power. In addition, switching between different power states is about 25% faster to benefit ULV (Ultra-low voltage) models using Haswell’s new more energy-efficient sleep state called S0ix mode. The graphics engines integrated into the Haswell CPUs are nowhere near the performance of Class 1 category graphics cards. These are all dedicated graphics engines starting with the NVidia GeForce GTX 780M/680M in single card or SLI (dual) configuration, as well as the AMD Radeon HD 8970M/7970M in single on crossfire mode. Class 1 category ends with the NVidia GTX-570M and the AMD Radeon 6950M and FirePro M6000. However, the top-of-the-line GPU integrated with some Haswell chips belong to Class 2 Category sandwiched between the NVidia GeForce GT 735M and the AMD Radeon HD 8690M. The rest of the GPUs currently integrated with Haswell CPUs belong in the Class 3 category with our HD Graphics 4000 at the bottom. Intel has been planning a radical GPU redesign known as the Broadwell but it is evident this was not in the works for the Haswell range of CPU products. Still, the overall performance gain of the new GPUs integrated with the Haswell CPU shows remarkable improvements that should give casual gamers reason to be happy, though without a dedicated GPU cards, any new Haswell will not satisfy serious gamers. Compared to our floor threshold for a notebook to qualify as a gaming device, the Intel HD 4000, the HD 4600 graphics used in most Haswell CPUs have been extensively modified to support DirectX 11.1, OpenCL 1.2 and OpenGL 4.0. It also boasts improved decoding abilities for 4K videos in upcoming home video resolution as well as in proving a fast Quick Sync encoder for editing high definition video content. The Intel HD Graphics 4600 (GT2) has a base clock that can be automatically overclocked with Turbo Boost technology. Depending on the processor model, the turbo clock rates (1150 – 1350 MHz) and shared L3 cache may differ widely resulting in disparate graphics performance between Haswell implementation. In addition, the graphics engine can drive up to three displays in different configurations with a maximum total resolution of 4k x 2k for all three monitors. Monitor connectivity include HDMI 1.4a and DisplayPort 1.2 which allows daisy chaining of more monitors with Display port connectivity. VGA is not supported except for non-ULV models. Its Wireless Display (WiDi) ver.4.1 allows for improved real time wireless video streaming with reduced latency delays for gaming software. If your HDTV has the Intel WiDi feature or connected to a WiDi device, you can play your games on the laptop while the video is on a larger HDTV screen. The improved video performance of in-built HD Graphics cards can be traced to the addition of more shader units made possible with more EUs. 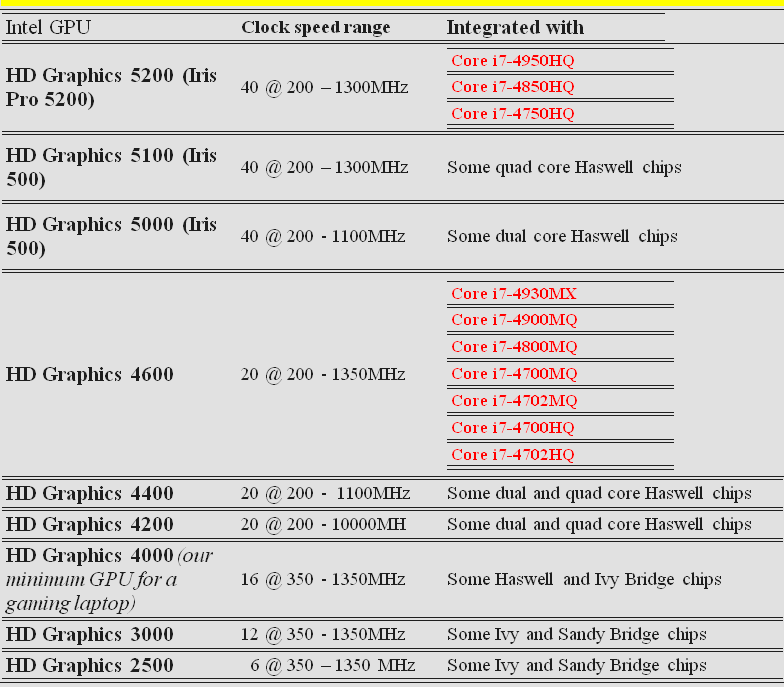 Ivy Bridge GPUs have 6 EUs (GT1) or 16 EUs (GT2) while the Haswell GPUs have 10 (GT1), 20 (GT2) and 40 (GT3) EUs. All Haswell models have a slightly re-built front-end which includes the new Resource Streamer and Tesseltator that reduce the driver overhead to effectively double its throughput.The top of the line Iris Pro Graphics 5200, also known as the HD Graphics 5200 belongs in the Class 2 category and is the only integrated GPU that has about the same performance as a dedicated GeForce GT 735M as well as the AMD Radeon HD869M. (see Table 4 for relative rankings in Class 2 category). In contrast, all the other Intel HD graphics belong to the lower midrange Class 3 category, including our threshold Intel HD Graphics 4000 which is equivalent to the AMD Radeon HD6620G (See Table 5 for relative rankings in Class 3 category GPUs). The Intel Iris Pro Graphics 5200 is a top-of- the-line integrated GT3 graphics engine exclusive to the 4th generation Haswell CPUs. Also known as the HD Graphics 5200, the 5200 sports the maximum configuration for an integrated Intel graphics card with 40 execution units (EU) and an additional 128 MB eDRAM cache directly positioned adjacent to the CPU. The base clock can be automatically overclocked using Turbo Boost technology. Depending on the processor model, the base and turbo clock rates may differ, resulting in varying graphics performance between CPU models. Compared to our threshold Intel HD Graphics 4000, the Iris Pro Graphics 5200 benefits from an extensive modification that makes it 150% faster than our threshold HD Graphics 4000 and is 50% faster the next most powerful integrated Haswell GPU, the HD Graphics 4600.. The GT3 card doubles the 20 EU’s in the 4600. With its eDRAM using a very wide 512-bit buss interface, the 5200 can have a throughput of 64 GB/sec at a clock rate of 500 MHz. This matches many dedicated mid-tier graphics cards like the NVidia GT 735M and the higher GT640M/650M, and can overtake a dual AMD HD 6775G2 in Crossfire configuration. A step down to the HD Graphics 5100 is an option that does away with the eDRAM cache and is just 125% faster the Intel HD Graphics 4000. 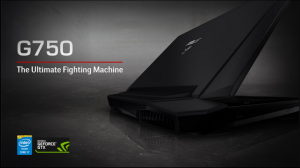 It has the same 40 EUs and 1300MHz maximum clock speed and can match the dedicated GPU NVidia GeForce 640M LE. Take another step down from a maximum 1300MHz clock speed to 1100MHz and you get the old HD Graphics 5000 which is also used in other lower end Haswell CPUs along with the older Ivy Bridge chips. Our tests using Intel benchmarks in 3DMark 11 showed that the HD Graphics 4600 clocks a 60% performance advantage over our threshold HD Graphic 4000 though our real-world gaming tests only reached an overall 30% improvement. Either result clearly puts the HD Graphics 4600 above our threshold and this can be attributed to the increased number of execution units (EU). This GT2 version has 20 EUs, compared to the older HD Graphics 4000’s 16 EUs. Hence, the HD Graphics 4600 is a good match for dedicated GPUs like the GeForce GT 630M/635M and AMD Radeon HD 6750M. And thanks to the 22n, Tri-Gate die shrink manufacturing process, this GPU gets low power consumption. The HD Graphics 4600 is used by several Haswell dual and quad core CPUs in the 37 – 57-watt TDP range. Power consumption was tested using the synthetic stress test provided with the Prime95 benchmarking software. The three Haswell CPUs tested, Core i7-4900MQ, the i7-4800MQ, and the i7-4702MQ exceeded their maximum specified TDP but this is typical behavior even in the older Ivy and Sand Bridge CPUs. After about 30 minutes, the Power Control Unit (PCU) built into the CPUs kicked in its power management ability to reduce the clock speeds that allowed the CPU to settle to its specified TDP. In short, these three cores achieved best possible performance when taking on a stable load allowing the PCU to manage the load taxing its thermal capacities. In contrast, the Core i7-4930MX and the 4700MQ exhibited constant clock speeds throughout the test. The slowest Haswell CPU, the i7-4702MQ hardly ever went beyond its specified maximum of 47 watts TDP at any time during the tests.Haswell CPUs boasts of the most significant claim to power efficiency gains in the current CPU generation. Intel had earlier aimed to achieve power consumption in the 35 to 45 watts range but is now talking about 10 to 20 watts using relatively the same mainstream chips. Haswell engineers were able to bring down mobile CPU power needs by a small but useful 20% reduction. Current Ultrabooks using Ivy Bridge CPUs offer slightly over 5 hours of battery life. But with Haswell, this goes up to 9 hours idling under Windows 8 and 6 hours of single task HD movie watching. Even more impressive is the fact that a Haswell laptop can go on standby for a week, periodically pulling data from social media and incoming emails, thanks to Haswell’s better power management features that involve new S0ix sleep states. The 4th generation Haswell CPUs, (you see, the quad core CPUs has already tucked in 4 generations since the Sandy Bridge CPUs) currently does not have that much performance gain with existing applications. The games are actually better served by dedicated graphics engines and while the changes in the HD graphics have made them more competent, it will still take time for new game apps to take advantage of the added EUs, but for sure, the higher clock rates will benefit old games as well. Then again, serious gamers hardly ever use integrated GPUs and prefer to use dedicated ones singly or in dual configurations. But for its improvements in power management, mobile gamers stand to benefit with a little more juice left. Even a 20% improvement can spell the difference between a laptop dying on you and getting it charged just in time. 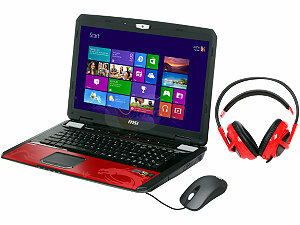 The Fangbook Evo reveals a new set of fangs for the serious gamer on the move with this HX7-350 model. 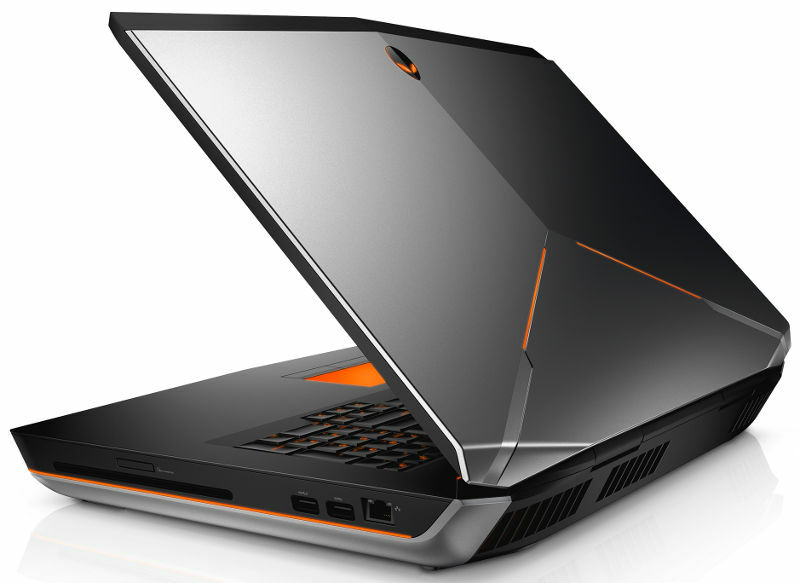 The Fangbook Evo reveals a new set of fangs for the serious gamer on the move with this HX7-350 model. It is powered by the 4th Generation Haswell quad core i7-4700MQ clocked at 2.4GHz that can go up to 3.4GHz with Turbo Boost technology. Supported by a 16GB RAM upgradable to 32GB from two more vacant SODIMM sockets, this is a large laptop sporting a 17.3-inch full HD (1920 x 1080) non- glare display with LED backlighting that is superb for gaming as it is to watch HD movies. A dedicated high end NVIDIA GeForce GTX 780M with 4GB GDDR5 video RAM makes this an excellent choice for the serious gamer on the move. The GPU belongs to the Class 1 category of video cards and is considered the fastest single card from NVidia. Needless to say, the serous gamer will have no problem playing all the demanding games released over the last 2-3 years at high detail settings and at the default screen resolution. Coupled with NVidia’s Optimus technology, you can also switch from the dedicated GPU to low-power HD Graphic 4600 integrated into the Haswell CPU for significant battery savings when you’re not gaming. Data storage is served by a 750 GB SATA HHD supplemented with a 250GB solid state drive that serious gamers can’t do without. It also has an 8x super multi optical drive. 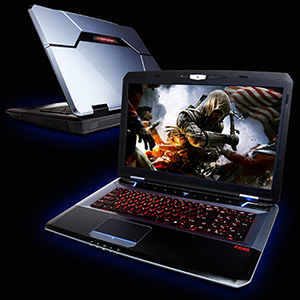 The ULTIMATE gaming laptop – If you want some ultimate experience get this one! At just a dollar short of $4,000, the MSI GT series takes the latest Intel Haswell CPU and the fastest single video card from NVidia to power what could well be the ultimate among the fastest gaming laptops in the market. Powered by the latest top end Haswell Intel Core i7 4930MX clocked as 3.0 GHz (can reach 3.9 GHz with Turbo Boost technology), the laptop comes with the fastest single card Class 1Category NVidia GeForce GTX 780M with its own 4GB video RAM to drive a full HD (1920 x 1080) resolution on its 17.3-inch non-glare display. 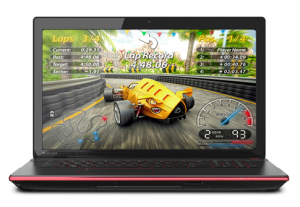 This makes the MSI GT70 one of the more rewarding gaming laptop of the serious gamer who likes his latest demanding FPS and RPG’s playable in full HD without ever stuttering. It comes with 32 GB DD3 system RAM (maxed out on 4 SODIMM sockets), while data storage is supported by a 1TB SATA hard disk drive supplemented with a 384 GB solid state drive configured in Super RAID 0 mode. Its multimedia prowess is capped off with a Blu-ray burner for its optical drive. All this comes at just 8.6 lbs and bundled with the 64-bit Windows 8. Ultimate Asus Model – TOP Of the line Its like the mercedes of Luxury Cars. This Asus G75 model makes some reasonable compromises for a very competent Haswell laptop to reach a more comfortable price point at $1,899. With the Core i7-4700HQ clocked at 2.4 GHz (maximum of 3.4GHZ using Turbo Boost) under the hood, and the 4th fastest Class 1 Category single card NVidia GeForce 770M with 3GB DDR5 video RAM, the Asus G75 Series G750JX-DB71 has what it takes to delight a budget-conscious serious gamer who has little patience with compromises for his PC games at the default HD resolution, which in this model, is full 1920 x 1080 full HD on a 17.3-inch display. With just a few exceptions like the Company of Heroes2, Metro: Last Night and Crisis 3, just about all games released over the last 2 years play at a seamless 40 fps frame rates at the default resolution and medium to highest game detail settings. Data storage is supported by a 1TB SATA hard disk drive running at 5400 RPM, and supplemented with a 256GB solid state device that serious PC gamers prefer to have for faster launching of games and new game levels. It also has a dual layer DVD optical reader/writer, Bluetooth 4.0, bundled with a 64-bit Windows 8 and comes with a 1-year accidental damage warrantee only from Asus. Can’t go wrong with top of the line Toshiba Qosmio – with 770m GPU its like PC experience on Laptop! Comfortably priced at $1,549.00, this Toshiba Qosmio X75-A7295 has one of the most brilliant 17.3-inch display from Toshiba’s TrueBrite screen technology boasting a full HD (1920 x 1080) resolution. Lavished in textured aluminum in Black Widow finish, this Qosmio X75 model is powered by the 4th generation Haswell quad core i7-4700MQ with 16GB DDR RAM. But apart from the price, what endears this laptop to serious gamers is its NVidia GeForce GTX 770M, the 4th fastest GPU in the Class 1 Category line of graphics engines capable of playing all the current RPG and FSP games at the default resolution and highest gaming details. There are just a few exceptions, such as Metro: Last Night, Company of Heroes 2 and Crysis 3 which will have difficulty in the Ultra-High game settings at default resolution. Stepping down to High setting is not objectionable to veteran PC gamers. Storing all your games is not a problem with its dual 500GB SATA hard disk space running at 7200 RPM. Alternatively, you can replace one of the drives with a 256GB solid state device which serous gamers often do, either at point of sale or later on as an upgrade. There’s a DVD Super-Multi optical drive, a Harman-Kardon 4-speaker system and comes bundled with Windows 8, Adobe Premiere Elements 2.0 and Adobe Photoshop Elements 2.0. No Best Gaming Laptops Review is complete without the sager brand – completely customizable! Since 1999, the Sager brand has been churning out powerful great value customizable gaming laptops that have gained significant market following among serous gamers. This Sager NP9390-S starts with a base price of $2,346.43 with a base hardware specification starting with a 17.3-inch anti-glare matte display at full HD (1920 x 1080) resolution. The minimum configuration starts with an upgradeable 4th generation Haswell Intel Core i7-4700MQ on the Intel HM87 chipset and supported by 24 GB DDR system RAM on four SODIMM sockets, which means you get it upgraded to 32GB at point of sale. 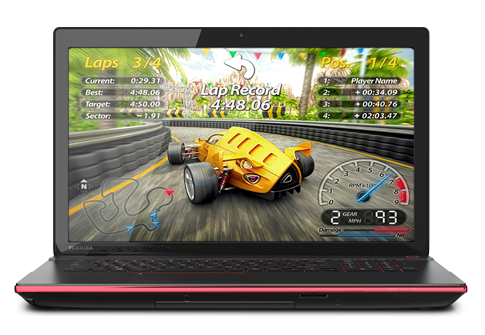 But what makes this one of the most powerful gaming laptops on earth at this time is its dual AMD Radeon HD 8970M graphics card in crossfire mode with its own 4 GB GDDR5 video RAM. This tandem makes it the second fastest graphics engine in the Class 1 Category of GPUs, upgradable only to a dual GTX 780M in SLI mode to make the Sager NP9390 the fastest gaming laptop on the planet at this price point. It even has a premium Sound Blaster X-Fi MB3 audio system driving Onkyo speakers and a subwoofer. The NP9390 comes with a 6x Blu-ray reader/8x DVD super multilayer optical drive, and a detachable 750GB SATA hard drive running at 7200 RPM with a 240 GB Crucial M5 solid state drive in Raid 0/1 configuration. With USB 3.0, HD video camera, Bluetooth and WiFi, this Sager even at its minimum configuration has to be one of the ultimate rigs for demanding gamers on the move. Powered by the 4th gen Intel Core i7-4702HQ clocked at 2.2GHz/3.2GHz (with Turbo Boost) on the Intel HM 87 chipset, this latest Razer Blade iteration is considered the world’s thinnest laptop at only 0.66 inch thick. Its 14-inch LED backlit display with 1600 x 900 HD resolution may be modest but is quite matched with a Class 1 Category mid-range NVidia GeForce GTX 765M with its own 2GB GDDR5 video RAM. No need for full HD since many of the most demanding RPG and FSP games releases are better served at the default resolution even when using the Ultra-High game settings. Its Optimus technology allows you to switch to the CPU’s integrated HD Graphics 4600 for lesser battery drain when using non-gaming apps. 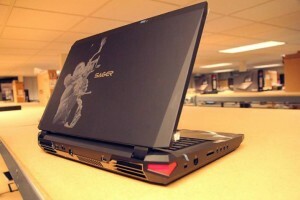 Its thin profile goes with its superbly light 4.6 lbs weight, making it the lightest gaming laptop in the market today. This, however, comes at a price. Data and system storage is supported only with a choice of 126, 256 or 512 SATA III solid state device. There is also no optical drive which is just fine for gamers who play online games. Nevertheless, it comes with the necessary gaming-grade peripherals like Synapse 2.0, anti-ghosting backlit keyboard, adjustable track pad, as well as WiFi, HDMI 1.4a, Bluetooth 4.0. USB 3.0, built-in stereo speakers, and a Dolby home theater system. 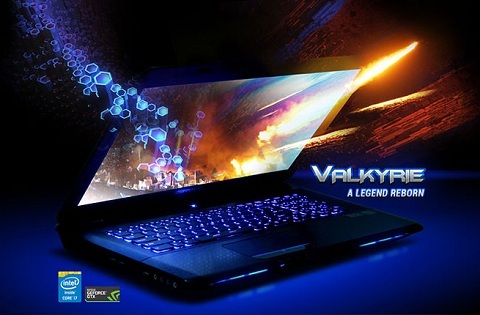 Priced at $1,839, this Valkyrie gaming laptop is sure to delight budget conscious veteran gamers. Priced at $1,839, this Valkyrie gaming laptop is sure to delight budget conscious veteran gamers. With a 4th generation Haswell quad core i7-4700MQ clocked at 2.4GHz (3.4 GHz with Turbo Boost) under the hood. 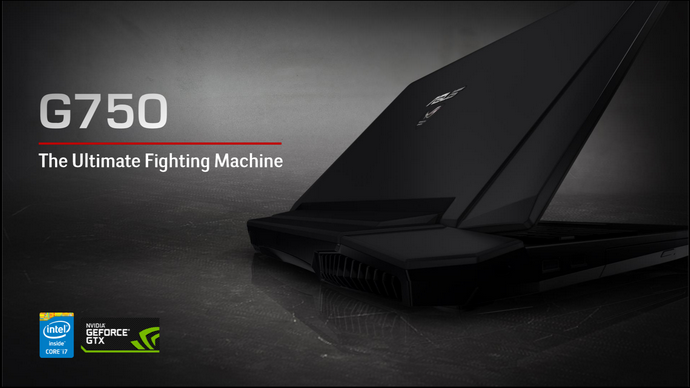 It uses the NVidia GeForce GTX 770M, the 4th fastest single card under Class 1 category GPUc. to drive its gorgeous 17.3-inch LED backlit display with full HD (1920 x 1080) resolution. It comes with a 32GB DDR3 system RAM in four SODIMM slots and a dedicated 3GB video RAM to make playing some of the most demanding games without a hitch on its default resolution at the highest game settings. Only Crysis 3, Far Cry 3 and Company of Heroes 2 will have some problems at their Ultra-High game settings but you can also step down to the next lower level from a more seamless gameplay. You get a 1 TB SATA drive running at 5400 RPM and 120GB SSD that gamers prefer to have, as well as a 6x Blu-ray ROM optical drive and a 4-in-1 media card reader. Its stereo speakers are assisted by a subwoofer and driven by a THX True Studio Pro sound system from Realtek. All these are packaged in a 2.2-inch thick laptop weighing a backpack friendly 7 lbs, easily one of the lightest high performing gaming laptops. It’s also bundled with a 64-bit Windows version 8.0. This Alienware gaming laptop from Dell is one of the few 18.4-inch screen display we have tested sporting full HD (1920 x 1080) resolution. 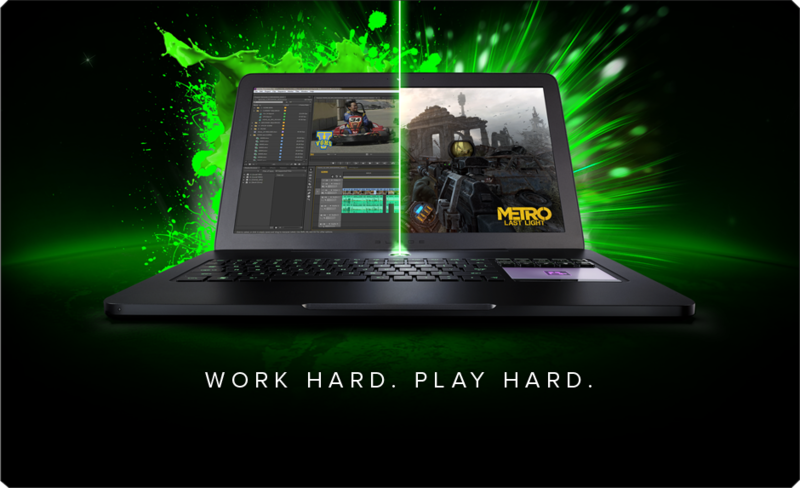 Powered by a 4th generation Haswell-based Intel Core i7-4700MQ clocked at 2.4GHz (3.4GHz with Turbo Boost) and a 16 GB DIMM RAM, this humongous laptop takes gaming to the max with a dual Class 1 Category NVidia GeForce GTX 765M, the second fastest NVidia graphics engine in SLI mode. With the exception of the Ultra-High game settings on the 2013-released Company of Heroes 2, Crysis 3 and Far Cry 3 games, all the most demanding RPG and FSP games play seamlessly at their highest gaming details at the default full HD resolution. Data storage is supported with a 750GB HDD running at 7200 RPM, while game sounds are a step ahead of typical laptop sound with Klipsch-certified speakers driven by a preloaded Dolby Home Theater v4 system. It comes with Broadcom 5G WiFi, three USB 3.0 ports, a mini-display port, HDMI 1.4 port and a 9-in-1 media card reader. With its size and 2.15-inch profile, don’t be surprised with its hefty 11.9-lb weight. But for just $2,097.96, this Alienware has to be the best value gaming laptop at this size and gaming performance. It comes bundled with a 64-vit Windows 7 Home Premium OS. Hi, a few months ago i asked about a general purpose laptop for gaming and you suggested that i get the Lenovo Y500 with an Nvidia 650M in SLI configuration, well i was chuffed when i saw it was about 1000 dollars and tried to get it via amazon and the Lenovo website itself however i was a little less chuffed to find out that neither ships to italy where i currently live, not without expansive twists and turns that would negate the money i would save by getting that particular machine, anyhow, i decided to look elsewhere meanwhile see what i could get for a decent price with decent performance, most sites, even on custom laptop sites would not really let me configure things with decent GPU’s without a baseline 4th Gen i7 which in turn meant that the price skyrocketed, anything past the Nvidia 750 went and settled in the 1500$ and they would not ship to italy anyway, on the european sites things were worse as prices were higher with the 1500$ figure becoming euros, anyway i finally came across an MSI product, a GX70 with an AMD Radeon 8970M which after reading around seems to be a fairly decent card, however the catch is that it has an AMD Richland A10-5750M CPU, which i have not been able to find much about with everyone ranting and raving about Intel and their Haswell series and probably with good reason, i am all set to get the above mentioned MSI which goes for a price of 1099$ and would ship to italy with 100 more but do you have any information on the AMD Richland CPU? I have had an AMD laptop before, back in the day of the Turion which at the time worked pretty well it muscled through most things i threw at it easily but it seems AMD has had the wind knocked out of their sails lately, at least in the notebook area of things. So yeah long story short is that CPU any good for moderate to high gaming? Think Skyrim and Far Cry 3 type of gaming at high, not necessarily Ultra settings.